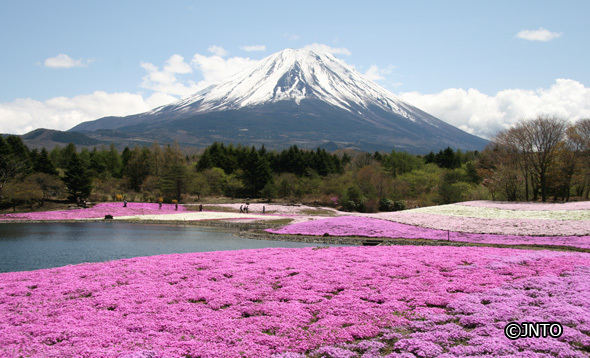 Travel off the beaten path after a visit in Tokyo to the natural wonders of Mt. 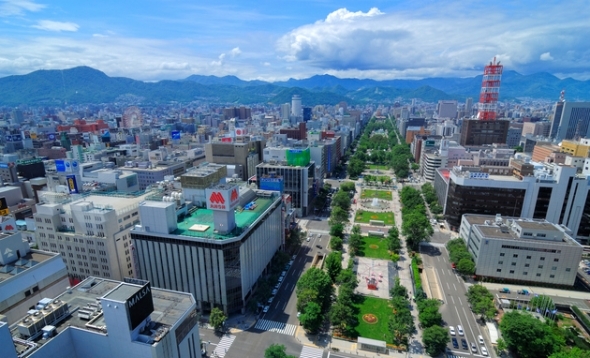 Fuji, Kawaguchiko, and the Japanese Alps blended with modern and historical experience in Nagoya, Kyoto and Matsumoto. Then go off the beaten path in Northern Japan in traditional Nikko and Hiraizumi combined with modern Sendai and Aomori. End the trip in gorgeous Hokkaido, visit the breawth taking Hakodate and multi-culturally rich Sapporo and Otaru. Welcome to Japan! Transfer by coach to hotel. Meeting with guide. Late in the afternoon, we will pay a visit to this fascinating country by taking a trip on the metro (tickets included) to the Shinjuku district and see the crowds of people who use this modern and efficient collective transport system. Shinjuku is one of the most important nightlife districts. Dinner included and return to hotel by metro with our guide. NOTE: This visit may take place on the day of arrival or after the panoramic city tour next day, depending on the passenger flight arrival times. In the morning, we take part in a 5-hour trip with our guide to see this amazing city, with its hustle and bustle and extremely modern districts that coexist with quiet, peaceful areas. Brief stop at the Zojoji Temple to make a beautiful photograph of the Tokyo Tower. Pay attention to the hundred of Jizos, stone traditional protecting deities who guide us on our travels, give power to those who are weak (such children) and those in dangerous places, and who are dressed including hats, robes and windmills. Then we head to the junction of Shibuya, a junction that is said to be the most crowded in the world. The Meiji Temple is dedicated to the Emperor Meiji, his wife, and their spirits. We continue on our bus along the elegant street of Omotesando. We will edge the most beautiful part of the Imperial Palace and the gardens. Stop to visit the famous Nijubashi Bridge. 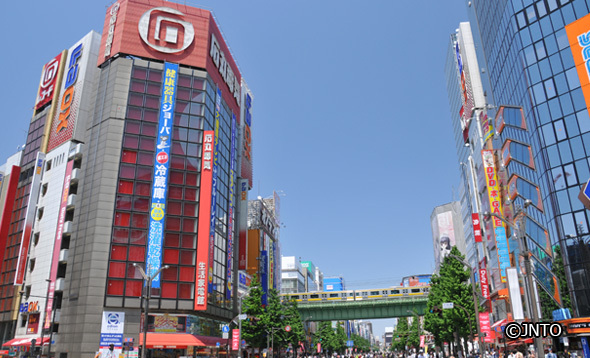 We will pass through the district of Akihabara, the “electric town” with icons from the popular Japanese Manga and Anime culture and then see Kokugikan, the Sumo stadium, home of this Japanese sport. We will also visit the Buddhist temple of Sensoji, the oldest and most important temple in Tokyo, with its 55-metre high pagoda. 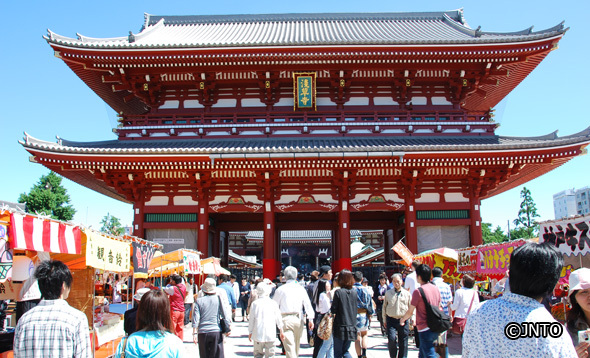 Then we will have some free time to visit the traditional commercial street of Nakamise in the district of Asakusa. Lunch included in a local restaurant. Return to hotel. We travel to the beautiful area of Monte Fuji, through pretty countryside on our way. First of all we see the ARAKURAYAMA SENGEN PARK, with its beautiful pagodas, and from here enjoy the best and most well-known views of Mount Fuji. After this we go on to KAWAGUCHIKO with its tiny houses, flowers and mountains, and its beautiful lake. On our arrival, we will visit the FUJI SENGEN SHRINE set in a magical site surrounded by tall trees, and the starting point of the traditional pilgrimage to the mountain. At the shrine, we will express our thanks for being able to visit this wonderful place. The visit also includes a delightful boat trip on Kawaguchiko Lake. After lunch, we start to ascend Mount Fuji on the road that takes us to the “fifth station”, surrounded by spectacular forests and views, to a height of 2,305 metres. Note: In winter, the route up to Mount Fuji is closed due to snow or other adverse weather conditions; during this season, we will ascend as far as the authorised point. Return to Kawaguchiko, with time to stroll near the lake. We will stay at a Ryokan (a traditional Japanese hotel), and have the chance to enjoy its ONSEN (public baths). Dinner included. (NB: In the planned Ryokan, some rooms are in Japanese style, with accommodation on tatamis, and others are in western-style). In the morning, we continue along the pretty road bordered by lakes to IYASHI NO SATO NENBA, a tiny village destroyed by a typhoon in 1966 and later restored as a traditional open-air mountain village and museum. Its traditional houses have been transformed into arts and crafts shops, restaurants and traditional museums. We then have the opportunity to admire the SHIRAITO FALLS, considered done of the most attractive sites in Japan, with a waterfall height of 150 metres. We will then continue to NAGOYA, the third most important city of Japan, on the shores of the Pacific. Here we will visit the TOYOTA MUSEUM (admission included), a must-see for motor lovers. We continue to KYOTO, accomodation. We set out for TSUMAGO, passing attractive country scenery on our way. This small village with its wooden houses is one of the prettiest places in Japan. Free time to explore and lunch included. Then we continue to MATSUMOTO, a tourist city, where we will visit the impressive 16th century castle, known as the “Crow Castle”. Free time to explore this bustling tourist city. We continue to NAGANO, accommodation. In NAGANO we will see the Zenko-ji, a place of pilgrimage with the first Buddhist image in Japan. Our travellers will be included the Gomakuyo ceremony to bring luck. After this, we will travel to the beautiful Japanese Alps and in the mountains we will go to the JIGOKUDANI Monkey Park, where we will include lunch and stroll amidst its forests with its rivers and spa waters where colonies of Japanese macaques live and bathe. After this, very beautiful high mountain scenery (we go up to 2,172 metres), passing semi-active volcanoes. KUSATSU, an attractive spa town, its main square full of life. We will include attendance at a Yumomi show, with its actresses and singing telling us about the traditional method used to cool the spa waters. We follow this with a walk in the city park which has the open air Onsen. Then on to IKAHO, a picturesque spa town where we will stroll in its ancient centre with its staircase streets. We will stay at a RYOKAN, a Japanese style hotel where we will continue to enjoy its baths. Traditional Japanese dinner included. NB: In the autumn, depending on the amount of fruit in the mountains, the movement of the monkeys is unpredictable. If the macaques do not come down to the park, it may be closed. The visit to Kusatsu and the Yumoni show are cancelled due to the weather from November to April. We continue on our way to NIKKO. In this fantastic town, we will visit the impressive Toshogu shrine with its outstanding room where the clapper of a priest suggests the sound of a crying dragon. We will also visit Taiyuin-byo Mausoleum, a site surrounded by peaceful scenery. We will go for a stroll along the river in Kanmangafuchi, under the attentive watch of hundreds of Jizo statues! We will enjoy some free time in the city’s centre before departing for SENDAI, a modern, bustling city with more than 1 million inhabitants. You will have a chance to stroll around and have supper in its lively centre. 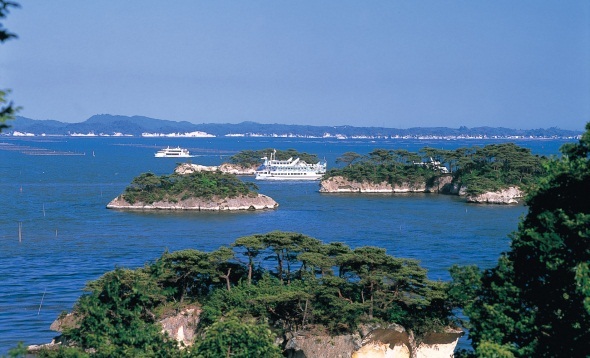 We depart for the marvellous city of MATSHUSHIMA, on the “Thousand Islands” Bay in the Pacific Ocean and considered one of the most attractive cities in Japan. After arriving, we will visit a magnificent “tea house” overlooking the sea and enjoy a cup of traditional tea while our guide tells us about the city. Then we will go on a 50-minute cruise (included). Lunch included. 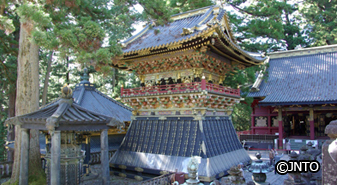 We continue to HIRAIZUMI to visit its temples and the UNESCO World Heritage. In a first step we visit the magnificent Buddhist temples of Chusonji. We take time to relax in the gardens of Motsuiji temple, where passengers can take part in a Zen ceremony(admission included). Finally, we will know Site of Takkoku no Iwaya, carved in the rock in 801. We then carry on to MORIOKA, the pleasant capital of Iwate province, where we settle in at our hotel and have some free time to explore. 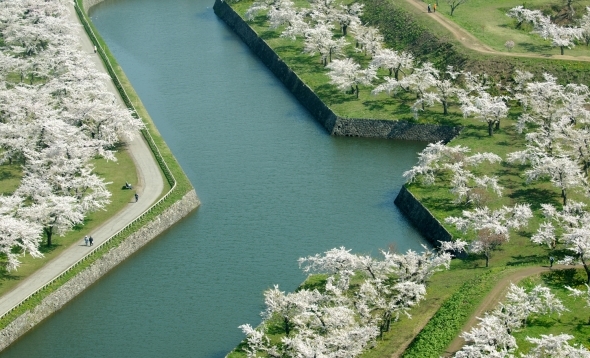 In a region of beautiful scenery, we travel to HIROSAKI, where we will visit its castle in a beautiful park where more than 2,500 cherry trees blossom in the spring. After this we go on to AOMORI, the provincial capital of the Bay of Mutsu. We will see the Nebuta Museum where we will learn about the Japanese traditional parties that remind us of carnival, with their painted and lit up floats. Lunch included in a local restaurant. Then we board the ferry to HOKKAIDO Island. The crossing takes just over three and a half hours. HAKODATE –Arrival-. 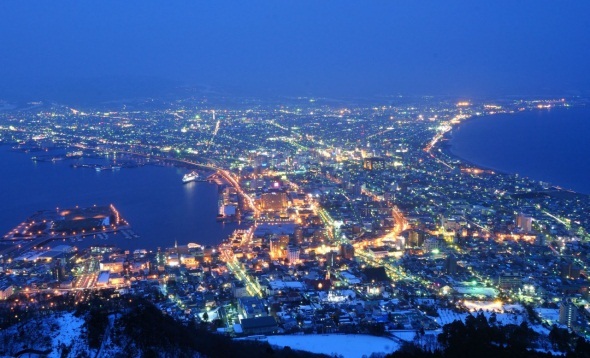 Before going to our hotel, we will ascend Mount Hakodate, which has wonderful views. We make the descent by cable car. Time in the beautiful city pedestrian centre in which to admire the influence of other cultures in the city (Russian Orthodox and Christian churches). In the morning we visit the impressive and busy fish market. Then we climb the GORYOKAKU Tower with its impressive views, from where we can make out the star-shaped fortress of Hakodate. Then we will take a stroll through the castle area before continuing to ONUMA. Free time in this wonderful tourist site, with its countless small islands in which to explore the islands, go on a boat trip and have lunch included. City tour (included) stopping at the clock tower and Odori Koen avenue-park, dominated by the telecommunications tower. 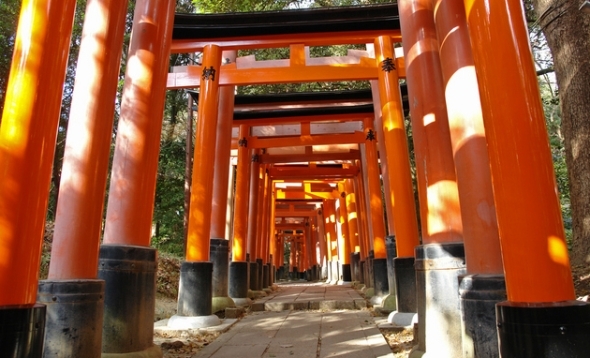 We will see the beautiful Shinto shrine of Hokkaido Jingu. The visit includes a ceremonial Kito (prayer session) in which we give thanks for the journey. At the surronding of Sapporo, we visit the Ainu Cultural Museum, with information about the Ainu culture, a people of Eskimo origin that lived in the North of Japan. 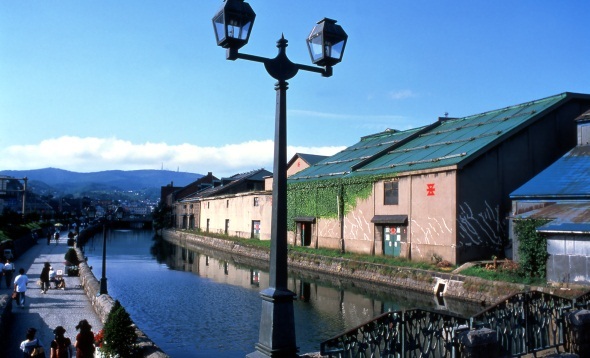 We then continue to OTARU, a small city with a European air and streets filled with shops, an old canal and tiny museums. Lunch included. We return to Sapporo at about 4.30 hrs. Free time in the afternoon. 10 Lunch or Dinner Included in: Tokyo, Tokyo, Kawaguchiko, Tsumago, Nagano, Ikaho, Matsushima, Aomori, Onuma, Sapporo. Includes arrival transfer Excursion: Otaru in Sapporo. Boat: Kawaguchiko Lake, Cruise in Matshushima. City tour in : Tokyo, Kyoto, Sapporo. Evening Transfer: Shinjuku in Tokyo, Traditional quarter of Gion in Kyoto. Ticket admission: Metro, Zojoji Temple, Meiji Temple, Sensoji Temple in Tokyo, Arakurayama Sengen Park in Mont Fuji, Fuji Sengen Shrine in Kawaguchiko, Village Museum in Iyasi No Sato Nenba, Toyota Museum, Tenryu-ji Temple, Arashiyama bamboo forest in Kyoto, Fushimi Inari, Imperial Palace, Kinkakuji Temple in Kyoto, Matsumoto Castle, Zenko-ji Temple, Gomakuyo ceremony,Jigokudani Monkey Park in Nagano, Yumomi performance in Kusatsu, Nikko Toshogu Shrine, Taiyuinbyo Mausoleum in Nikko, Traditional tea in Matshushima, Chusonji, Zen practice in Montsuiji, Takkoku no Iwaya Temple, Castle in Hirosaki, Nebuta Museum in Aomori, Goryokaku Tower in Hakodate, Sanctuary of Hokkaido Jingu and Kito prayer session, Ainu Cultural Center in Sapporo. Ferry: Aomori Hakodate (Hokkaido Island). Funicular: Hakodate Mountain. The route will be bilingual with Spanish and English speaking guides. On certain dates, depending on size, the circuit will be divided into two with a bus in each language. Hotels in Japan: Because of the high hotel occupancy at cetain times due ot trade fairs, events and local and international festivals, it may not be possible to stay at the hotel which is indicated for the circuit. In such case, accommodation (equivalent category) will be offered in the same city or in near city. In many hotels in Japan, there are no Double rooms (one bed), the room will be a twin (two single beds). This tour is organized by EUROPA MUNDO VACACIONES S.L. (C.I.C.MA 904-sPAIN) a company n the JTB group, with a registered business address at Calle Garcia de Paredes 55, 1º, 28010 Madrid, Spain. The services provided by Europamundo Vacaciones S.L. are overland. They start at the time when the customer receives the first service provided by our company (always following the border and customs formalities), and end when the customer receives the last scheduled service (transfer, breakfast, or the corresponding service, according to the purchased package). Europamundo Vacaciones S.L. is not responsible for the consequences or circumstances arising from services that are not provided by our company (flight disruptions, loss or damage of luggage on flights, problems at borders/customs or those related to documentation, etc.). The customer can check the information that Europamundo Vacaciones provides on the “My Trip” web page created exclusively for them and it can be found on the travel voucher which confirms their services. We strongly recommend that all passengers check the information (to correct their names, dates and flights for transfers, etc.). Europamundo cannot treat any reservation as cancelled while the online cancellation has not been completed. The travel agent will check the receipt of the final cancellation that will arrive from Europamundo following the online cancellation, ensuring that all the details specified are correct. The customer may cancel the requested or booked services at any time, whereby they are entitled to a refund for the paid amount, but must compensate the agency, except in cases of force majeure, as per the following: The processing costs plus the cancellation cost, if these have been incurred, once the journey has been confirmed by Europamundo and regardless of the departure date. *Cancellation period is based on Spain time. No shows at the start of the trip, without prior cancellation, will not be entitled to any refund (except force majeure, which will be examined on a case by case basis). Different cancellation conditions apply for some programs (circuits that include train / airplane / cruise routes; or circuits to Kenya and Tanzania); and during particularly difficult dates (fairs, special events, periods involving increased hotel booking difficulties). The representative operator may, in turn, charge for the processing fees that have accrued in accordance with the provisions of the law in the country where the sale occurs. •In the event that the cancellation prior to the trip is produced by justified and demonstrable force majeure, only the costs of processing and services that cannot be cancelled will be charged, as well as the costs that must be absorbed by other providers (transfer on arrival, hotel in first city stay in the absence of prior notice, etc.). We recommend taking out insurance against cancellation in all cases. •In the event that, during the tour, a customer has to cancel their tour for reasons of force majeure, they will be entitled to a refund proportionally to the paid amount / time not used. The processing fees and expenses incurred will be charged in all cases. In order to calculate this amount, only the services provided by Europamundo will be taken into account (excluding the sections undertaken by air, except on those tours that have flights included), and the reimbursement is made on the amount charged by Europamundo to the tour operator (which is therefore subject to a deduction for the commission paid). •In instances where, following the withdrawal or cancellation of any passenger en route, the category of room occupancy is reduced (from double to single, or from triple to double), the difference in the cost of this, if applicable, will be passed on in the amount owed to the customer that has cancelled. Changes made to a confirmed booking prior to the start of a trip and more than 10 days before departure (changes to arrival or departure date, change of tour, etc.) are subject to a penalty equivalent to the processing fees that are listed in the cancellation section. A moderate degree of physical health and physical ability is required to participate in our tours. In the event of any passenger with special physical or mental needs, or in cases where a passenger over 80 years of age is travelling alone, Europamundo must be informed in writing at the time of booking, which will be analyzed on a case by case basis, and it is possible that Europamundo may request a medical report. In cases in which the customer accepts the tour, Europamundo cannot assume any responsibility in relation to the difficulty or impossibility that the said passenger may encounter in undertaking the activities planned for the tour package, nor can Europamundo assume any responsibility for providing assistance for their adaptation to, or continuation of, the trip. No reservations will be accepted and Europamundo reserves the right to suspend any tour for passengers whose physical and/or mental conditions make their participation in it very difficult or dangerous to themselves or others. Europamundo likewise reserves the right to exclude passengers who significantly disrupt the smooth-running of the trip. In general, any service that is not detailed as being included in the program, contract or information will be provided to the traveler, e.g. : airport taxes, visas, taxes to enter or leave a country, tips (which are obligatory, as specified on the voucher, for few destinations like the USA, and must be paid directly on arrival to the driver and/or guide), extras in hotels, optional activities, and usually drinks during meals..
Europamundo cannot guarantee that all the rooms in the hotels will have double beds and it is possible that, in some hotels, the room will be a twin room (two single beds). In many hotels there are no triple rooms, with these actually being a double room (of one or two beds) with an additional bed (which in some cases might be a sofa-bed or a folding bed). The conditions and comfort are lower than double rooms. We do not recommend booking triple rooms for three adults; we would only suggest this for families travelling with a child. Cancellation rates will apply to the tour fare. If notice of cancellation is received, 1 day prior to tour starting date, 100%. 3 days to 2 days prior, 35% + non refundable booking fee. 10 days to 4 days prior, 25%+ non refundable booking fee, 30 days to 11 days prior, 10%+ non refundable booking fee, 31 days or more days prior, $200 non refundable booking fee. Cancellation period is based on Spain time. Cancellation period is based on Japan local time. Notice must be received during JTB USA office hours. Mon. - Fri., 9:00AM-5:30PM PST Except National Holidays.